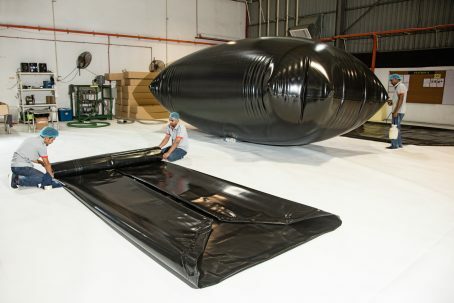 The Powertex Asia Pacific subsidiary of HOYER has manufactured its 30,000th flexitank in Malaysia. For a number of years HOYER has offered this mode of transport supplied from its own production plant to customers all over the world. The flexitanks are made from linear low-density polyethylene (LLDPE) and are especially suitable for transporting liquids such as food products and harmless chemicals in quantities from 14 cbm to 24 cbm. The logistics group had already invested in a joint venture in Malaysia in 2010, and the site near Kuala Lumpur has been fully owned by HOYER since 2014. The production facility has 23 employees in South-east Asia who oversee quality control, and fabricate 700-800 flexitanks of various sizes each month.